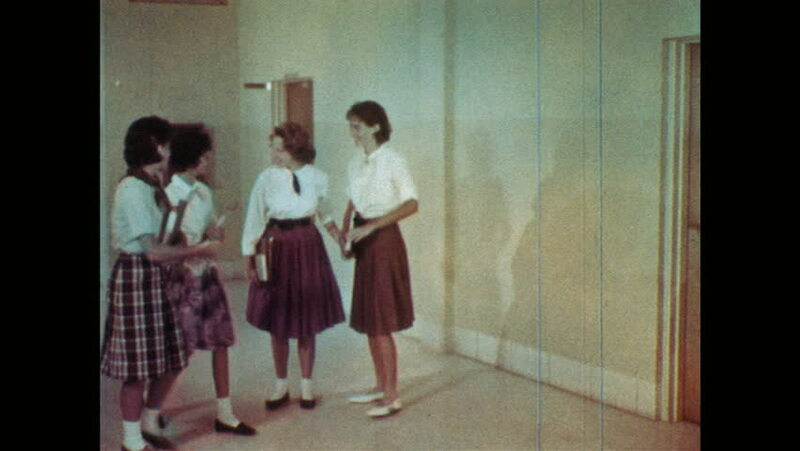 1960s: Girl meets other girls in hallway, girls walk past girls talking in the hallway. Group of students sit at table in classroom, girl hands paper to other girl, girl points at chalkboard. hd00:121970s: Teenage boys huff paint in living room. hd00:21Bride and groom in modern style wedding attire strike re-enact a proposal and kiss. Full length shot. hd00:31UNITED STATES: 1970s: animation of watch on man's wrist. Gamma rays hit people. hd00:58KYIV, UKRAINE - FEBRUARY 5, 2017. Fashion. Fashion show. Catwalk models. Catwalk during fashion show. Model on the catwalk. Models. Trend, style. Fashion industry trend and style. hd00:58KYIV, UKRAINE - FEBRUARY 5, 2017. Catwalk during fashion show. Model on the catwalk. Models.